BELGRADE — According to a poll, 39.7 percent of Serbian citizens believe that a renewal of a parliamentary monarchy would be a good idea. According to the poll done by Belgrade-based SAS Intelligence agency, 32.2 percent of citizens are strongly against the monarchy while 27.4 percent do not have an opinion on the issue. The agency presented the results of the first poll on the renewal of monarchy and reputation of Prince Aleksandar Karađorđević in Belgrade’s Media Center on Thursday. SAS Intelligence Executive Director Miljan Premović explained that the poll was carried out between April 11 and April 16 and that a total of 1,615 people in 16 Serbian towns, Kosovo excluded, had participated in it. He said that the poll had been carried out in all regions, in both urban and rural areas and that it covered both sexes and citizens of various aged and that it had a 95 percent trust interval “which makes it good enough for scientific publications”. “The main person who inspired us to conduct the poll was in fact world’s leading nation-branding expert Simon Anholt who believes that Serbia is one of the countries with the highest chance to renew the monarchy. Therefore we decided to give the public an insight into one of the social topics that have not been researched and show the mood regarding the renewal of monarchy. The question resembles a possible referendum question: Should Serbia be a parliamentary monarchy? The sample completely reflects Serbia’s social-demographic structure without Kosovo, according to the 2011 census,” he said. According to him, men with a high school diploma and unemployed men from urban areas mostly support the monarchy while highly educated people and pensioners, primarily from Belgrade, are against it. Unlike Belgrade, where there are most opponents of the monarchy, the majority of citizens in Vojvodina and central Serbia are in favor of it. 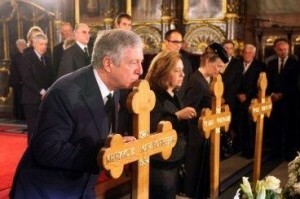 “Prince Aleksandar Karađorđević is absolutely recognizable in the public. 94.2 percent of citizens have heard of him but 42.2 do not have a clear opinion on him. As his most positive trait citizens recognize his humanitarian work – 37.5 percent and giving student scholarships – 13.7 percent, while 43.5 percent do not appreciate his lack of knowledge of the Serbian language,” Premović said. SAS Inteligence points out that it made sure to avoid media influence on the results of the poll. Historian a Crown Council member Čedomir Antić told daily Danas that “this is the first time in 23 years of Serbia’ republic, during which time two Constitutions have been passed, that the issue of the renewal of the monarchy is opened this way”. “Of course, the results would be less favorable in a possible referendum campaign, especially if the authorities were against it. However, this result does not show the power of the monarchy movement or the prince’s charisma but it shows that the republic is in crisis,” he said. “Almost five million citizens voted for president in 1990 and almost half as many voted last year. This is a sign that people see the president as a king who is not obligated by the Constitution and whose party wins when he wins, regardless of whether it won majority or not. All those who would like to stabilize Serbia probably see that we need a man who symbolizes the state, who is a king but does not rule, so our entire politics could be reduced to an election and parliamentary fight, work of the prime minister and the opposition,” Antić explained.